« Its only AFL but we like , like it , yes we do ! AFL footy has it all . Internal club squabbles and wrangling , sackings , droppings , re-instatements and apologies . And that' s just the off field action . , mirroring their off field turmoil , were annihilated by the powerful Eagles. Round 3 promises much . Scheduled , is a friday night blockbuster between old foes , Carlton and Collingwood . Co-tenants of the MCG , the Demons and Tigers play on Saturday , each hoping for their first win of the Season . Interstate duels , reports , close finishes , and fast paced action provide fans with superlative entertainment . Fans wearing their football jumpers , jerseys , guernseys , are loving the action , thrill and spectacle that is AFL footy . 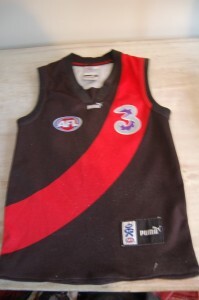 This entry was posted on Thursday, April 12th, 2012 at 9:34 am	and is filed under AFL, football jumpers, NRL. You can follow any responses to this entry through the RSS 2.0 feed. Both comments and pings are currently closed.